This piece of music has been special to me for a few years. BC & I tried writing to it, but it always felt like an epic piece of music verses your typical pop/rock song. So when we met Lindsey Stirling last year the light bulb 💡 went off. We are so happy this collaboration came together to add another layer. To top it off- having my beautiful wife’s soaring Chant like vocals on the “choruses” made it even more special. It’s flamenco like/aggressive nature makes me think of my grandmother Bi Bi Ballas. I know she would’ve been proud of this one. I hope you all enjoy it. In a tradition that started in 1978 with Frankie Avalon, the Toronto production of Grease: The Musical announced today four special cameo appearances by four surprise teen idols: Mark Ballas, George Canyon, Logan Henderson and Drake Bell - in the iconic role of 'Teen Angel'. A highlight of both the theatrical and film versions of Grease, the 'Teen Angel' cameo includes the song Beauty School Dropout, a fan favourite. The role was originated on Broadway by Alan Paul, later a member of The Manhattan Transfer, and was recorded by 50s teen idol Frankie Avalon for the 1978 film adaptation of Grease. "We asked legendary casting agent Robert Ulrich (Glee, The Glee Project) to find us a heartthrob to appear as the 'Teen Angel' for a week of shows. Instead, he found us four!" says David Galpern, Producer of Grease: The Musical. This is the second Toronto run for Grease: The Musical. It follows a sold-out 10-week run at the Elgin & Winter Garden Theatre Centre in Fall 2017. Janel Parrish (The Perfectionists, Pretty Little Liars) reprises the role of 'good girl gone bad' Sandy. In this new production, she will be joined onstage by newcomer Matthew Helfer (How To Be A Vampire) as Danny, and supported by a young, energetic cast of Pink Ladies and T-Birds. Mark Ballas, a veteran of 18 seasons of NBC's Dancing with the Stars, is also a choreographer, actor, singer and musician. He's appeared on Broadway in Jersey Boys. George Canyon, is a two-time Juno Award winner and winner of 8 Canadian Country Music Awards. His new album, Southside of Heaven releases on May 25. Logan Henderson rose to fame in 2009 with the Nickelodeon pop band and TV series Big Time Rush. After three successful singles, he is currently on a U.S. concert tour and has just released his latest solo album Echoes of Departure and The Endless Street of Dreams - Pt. 1. Drake Bell, star of the hit TV series, Drake & Josh, Fairly Odd Parents and The Amanda Show, released his debut pop album Honest in 2017 and is currently touring the United States. Performances of Grease: The Musical run Tuesday through Saturday evenings at 7:30 p.m.; matinees are Wednesday, Saturday and Sunday at 1:30 p.m. at The Elgin & Winter Garden Theatre Centre, 189 Yonge Street. Ticket prices range from $29 - $199 and can be purchased online at www.ticketmaster.ca, www.greaseonstage.com/tickets, by phone at 1-855- 985-5000, or at The Elgin Winter Garden Theatre Centre Box Office, during regular business hours. 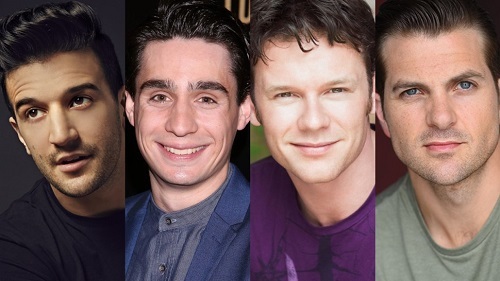 The Muny has announced the leading quartet for its upcoming production of the Tony-winning musical Jersey Boys, which will play the outdoor St. Louis venue July 9–16. Directed and choreographed by Josh Rhodes (Bright Star) with music direction by Rick Bertone, the cast will be led by Emmy nominee Mark Ballas (Dancing with the Stars, Jersey Boys) as Frankie Valli, Bobby Conte Thornton (A Bronx Tale) as Bob Gaudio, Nicolas Dromard (Mary Poppins, Jersey Boys) as Tommy DeVito, and Keith Hines (Jersey Boys national tour) as Nick Massi. After Broadway, Off-Broadway, touring, and international productions, the Muny will be the first regional theatre to create its own production of the award-winning musical. The musical, which tells the behind-the-music story of Frankie Valli and the Four Seasons, opened in New York November 6, 2005, and ended its 11-year Broadway run January 15, 2017. The musical returned to New York in November 2017 at Off-Broadway’s New World Stages. Jersey Boys is written by Marshall Brickman and Rick Elice, with music by Bob Gaudio and lyrics by Bob Crewe. 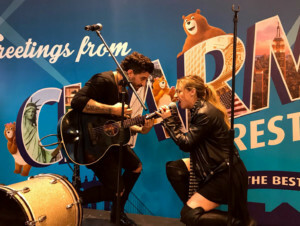 Mark Ballas is best known as a pro and two-time mirrorball champion on Dancing with the Stars, but these days he is more likely to be found with a guitar in hand, performing original music with his equally talented wife, BC Jean. They call their band Alexander Jean(a blend of their middle names) and they are a match made in musical heaven. Broadway Wiz was invited to see Mark and BC perform at the Charmin Restrooms Wrap Party in Times Square and it was evident how much chemistry they have on stage together. Mark, what came first, your love of music or dancing? Mark: For me, it was kind of all at once. I come from a family of musicians. My dad was a flamenco guitar player. My grandmother was a flamenco castanet player. My uncle is a guitar player and my mother was a dancer, so from a very young age I was always introduced to cool music, whether it be from flamenco to rock, blues, funk, soul. And then I was always around dancing. I loved music first because without music you can’t move and vice versa. They go hand in hand for me. My dad is a great guitar player, so I wanted to be a guitar player and then I discovered Kurt Cobain and then it was over, everything just kind of came together at once. From age 4 I went to musical theater classes on the weekend where I would do singing, acting, dancing, tap, jazz, all that stuff. I kept up with that every week until I was 21 years old. I went to a high school and college for musical theater. I started playing guitar at age 9 and then I started getting really heavy into dance when I was about 12. So, always been in the arts. BC, where does your love of music come from and when did you know you wanted to create music? BC: I have always loved music and I always would sing and it was always in me since I was very little. When I was five or six I would write poems. I would hide in my closet at night and write my emotions and cry and be romantic and then my poems became songs. When I was 13 I started writing actual songs and that turned into me wanting to sing and then I started taking voice lessons. I did piano lessons too when I was very young. My grandparents were also in the arts and did Perry Como and Fred Waring. They lived in upstate New York, so I grew up watching them always practicing and performing together, which was so cool. They were really talented. I think at 14 is when I convinced my parents I am serious. This is what I want to do for the rest of my life. Stop talking about college because I already know what I want to do. I want to go to LA and just write music and express myself. And they went for it, so since then I have been doing this. How would you describe the Alexander Jean sound? Mark: Raw for one because it always starts with the acoustic guitar and our voices. Mark: It’s insightful to our lives. We are kind of telling our stories but try to tell them in a non-selfish way so everyone can relate to them. I would like to say it’s a cocktail of rock/pop singer‑songwriter but yes, just very honest and raw. Can you tell us the story behind Paper Planes? Who’s idea was it to use wedding footage in the music video? Mark: Well, the cool thing was I had the riff for maybe two years and I would always play it. It was kind of a practice riff for me. BC: And we knew we wanted to write a song based upon our vows and our wedding and our love story. Something that other people can dance to at their wedding if they wanted to. Something very romantic. So when those two connected, we decided to do Paper Planes, Mark was folding up our vows into a box like a keepsake. It was an origami thing or paper planes. So that’s where the concept came in. I am not sure how it came about, but we ended up talking about it and how we should go back to our actual wedding venue and perform acoustically there and involve all of these things into one video. Actual footage from the wedding, the acoustic video, footage from the location, and honest lyrics from our vows. What’s the best part of getting to work together? Mark: Oh, man. We just get to do so many cool things. I mean, we have been on tour with Lindsey Stirling. In the last year and a half, we have had three tours. We have been playing massive theaters and small arenas and then we play small venues like a cafe back home. We played Webster Hall here a few times. BC: We get to do what we love with the person we love. We get to travel together and do cool events like this. Mark: I mean, we were in Portland, Oregon yesterday and then we flew here overnight. BC: And we have each other. BC: It would be much more boring if we were by ourselves. We could hang out. It’s cool. How do you both like to unwind after a show? BC: Either whiskey or some yoga. I actually did some yoga in the Charmin Zen bathroom over there earlier. Have you seen them? They are really cool. There are 14 different rooms. Mark: It is really cool, because when I was on Jersey Boys, I would walk through this area every day trying to find a clean bathroom. So the fact Charmin has done this, it’s cleaned after every use, it’s like right here. BC: You guys have to do a little tour of all of the bathrooms because they are really cool. Mark, we loved seeing you in Jersey Boys last year. Any plans to return to Broadway? Mark: I would love to, yes. It’s definitely on the list at some point. We would love to be in a show together. We talked about doing Jesus Christ Superstar. It would be cool with her as Mary, me as Judas, it would be kind of interesting because we play against each other. BC: Something rock and roll badass would be fun. BC, would you ever consider being a contestant on Dancing with the Stars? BC: Oh, I don’t know. I will see, if they ask me. You recently released a new Christmas music video– do you have any favorite holiday traditions? BC: Christmas is his dad’s birthday. Mark: It’s my dad’s birthday. So we always do the white elephant game with the family. Mark: But it’s changed this year. We are not doing that. Mark: Maybe Charmin could do them. I would wear those with a bear on them. Following back-to back No. 1 Itunes rankings for their first two EP's, recording duo Alexander Jean, composed of dancer and musician Mark Ballas and songwriter (and wife) BC Jean-- are getting in the holiday spirit with their first Christmas song. “We Three Kings” is the duo's rendition of the beloved Christmas carol, and it shines with their trademark style of raw rhythmic pop/rock. The duo is joined by American Idol alum Casey Abrams in a video premiering exclusively on Billboard. 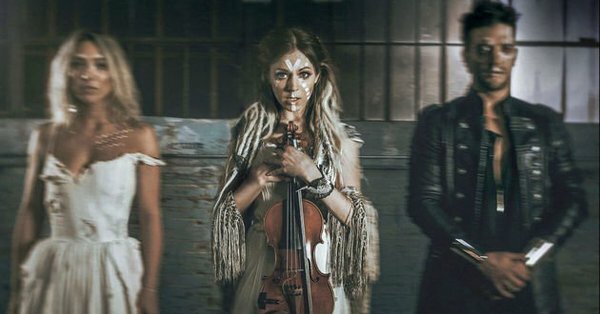 Alexander Jean are currently on tour as an opening act for acclaimed violinist and recent DWTS runner-up (and partner to Mark) Lindsey Stirling on her Warmer in the Winter Christmas tour. “We felt like we could do something earthy and cool with this particular song,” Mark and BC said. “This version of the holiday classic could be played any time of the year and be enjoyed. It’s not your traditional Christmas carol. "To us 'We Three Kings' was the perfect choice because although it is classic it sometimes lives in the shadows to some of the other famous Christmas tunes," they said. "Once we began playing with the arrangement we both felt we needed a third king, which led to the idea of having a featured artist. The light bulb went off immediately for us, we turned to each-other and said 'Casey Abrams' at the same time. We knew we wanted the third voice to have power and grit and also bring a third harmony to the table creating 'The Three Kings' sound enhancing our duo into a dynamic trio." “We Three Kings” will be available for purchase and streaming Thursday on all platforms. The season finale of Dancing With the Stars reunited the entire cast for one more show. First up was the favorite dances of the three finalists. Lindsey and Mark elected to dance their jive to Wake Me Up Before You Go by Wham! The fast and furious dance was a hit with the audience and the judges, earning Team Stark their 3rd perfect score of the final competition. The final round of dances was the dance fusion challenge, where the teams had to fuse to dance styles into one dance. Lindsey and Mark were assigned a cha cha/Paso Doble fusion to Hot2Touch. Once again Lindsey and Mark nailed it, getting a standing ovation and effusive praise from the judges. They earned three more 10's, giving them a perfect 140 score for the final competition. After the fusion dances the fans had 5 minutes to vote for their favorites, then the final placings were announced. Frankie Muniz and Witney Carson received third place and then Jordan Fisher and Lindsay Arnold were announced as the winners. Lindsey and Mark received second place for the competition. Congratulations to all the couples and thanks for an amazing season! © 2019 markballas.com. All Rights Reserved.